Let’s go way, way, way, way, WAY back to 2005. Eleven years ago, one of my all time favorite picture books debuted. 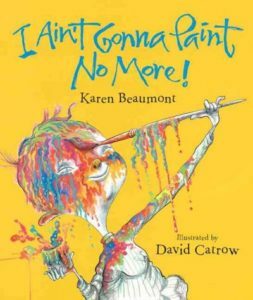 I Ain’t Gonna Pain No More!, written by Karen Beaumont and illustrated by David Catrow, is picture book gold. If you haven’t yet experienced the joy of this book, I urge you to put it on your holiday wish list. 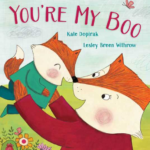 Holly Abston is the lucky duck winner of a signed copy of You’re My Boo, written by Kate Dopirak and illustrated by Lesley Breen Withrow. We will be taking a two-week break, so this is our last post of the year. We wish you a wonderful holiday season and look forward to seeing you in 2017! David Catrow, Karen Beaumont, Tammi Sauer. Bookmark. Yup, mine too. Love Karen Beaumont’s books generally, but this one is especially wonderful. 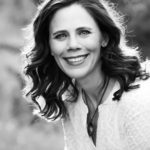 I want to be Jill’s list for receiving gifts! Love that book – truly one you can sing the text . And I love the messy, brilliant art! It’s a gem of a book. Such a great read. The art, the rhythm, the spirit – it all comes together. What’s not to love about this delightful book? Your #10 reason, “It’s a little bit naughty” is perfect. That little naughtiness makes a big impact. So, I confess, I have not read this one. Better go get it. 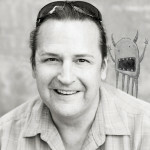 TY, Tammi. All those reasons will make it a great mentor text, too. How fun that this book is brand new to you? Enjoy! This book is fun to read to preschoolers! I haven’t read it either, but I soon will! Thanks, Tammi! Yes – a great sing-a-loud and so full of energy! Yup. It’s a gold star picture book. Oh yes! This is in the “Favorites” section of the bookshelves! Even just seeing that book on my shelf makes me happy. One of my favorites–the rhyme, the interactive page turns, the bright art! Can’t get the tune out of my head! Tammi, it’s one of my favorites, too. I always enjoyed reading this one in the library. I enjoyed the giggles and wide-eyed expressions of my younger students. I “watched” the book on You Tube. Great story and page turns! Thanks for sharing. Way fun!! (I watched the youtube video, too and can’t wait to see the book! I agree, this is one of my favorite books and was a favorite of my kids too! 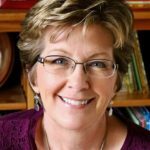 As a former school librarian, I loved to read this to students. I found out it’s based on the song “It ain’t gonna rain no more.” The rhythm and rhyme are perfect. Thanks for reminding me.